who knows it might be rare....??? Im not here to review the JG because the gun is 5 years old but the build principle is similar. 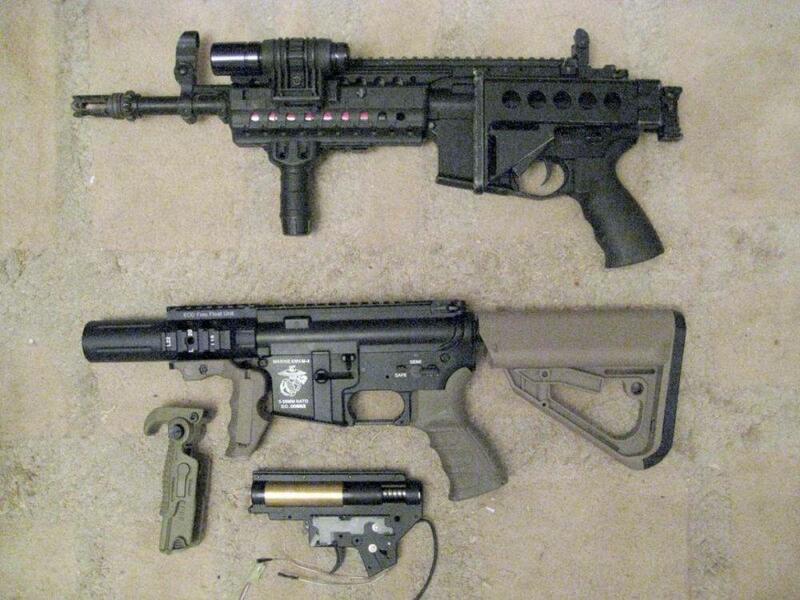 A budget CQB, good rate of fire, adaptable, fixable, hold its value, one to keep. Grip went on fine motor didnt whine etc.etc. So why did I us a para and fit an S system and not start with a JG S system. JG only did the S in plastic and the front mounted to the receiver differently. Its still running today from build (never missd a BB) and the only fault is that.. ALL jing gong paras had their outer barrel -14mm threads cut slightly off thus the flash hiders are a fraction out thus the Element Scar quick release hider and a slightly opened up suppressor end. what it is..... plus its too heavy for the dorris to get he mitts on. it will fit in your pocket. well it matches up. The ergo stock, I picked this because it has bigger tubes than the STR and the ACS, element g16 slim grip, CAA Magwell or the foldable and extendable grip. Im going to go with Tactical ARMS front and rear sights. and a cheeky lipo.